What Are Soak Off Gels? Soak off gels are a great alternative to the regular manicure. Gel manicures paint on like polish, dry like a laquer underneath UV lamps, and last for up to two weeks — in some cases even longer. The polish does not damage natural nails and does not need to be buffed or filed off, which can hurt the nail bed. Instead, with nail solution from the gel companies or by diluting the nails with nail polish remover and a buffer, the gels "soak" off. The basic procedure for a gel manicure starts with a clear base coat, which you add to the natural nail. Then choose a colored shellac, which is specific gel nail polish, and let it "cure" underneath a UV lamp for two minutes. You or the nail technician then layer another coat of colored shellac and place your nails underneath the light for another two minutes. Then, add the top coat to seal the color and put the nails under the UV lamp for two final minutes. Dab cotton or a gauze pad with alcohol and swipe the nails to make them smooth. Like with regular nail polish, the nails need to be soaked in a solution much like acetone or nail polish remover. Gel nail polish companies like CND and OPI have their own shellac removers. Catherine Saint Louis, a writer for the New York Times, says that "pads moist with acetone or a specially made remover are placed on the fingernail or toenail and worn for 10 to 25 minutes, depending on the brand." She goes on to explain that the you or the nail technician need to buff or file off "crumbs" of polish. Caroline Sydney of The Dallas Morning News says that her soak off gel nail polish manicure lasted for three weeks with minimal chips. Companies like OPI and CND claim that their shellac colors will last for two weeks before they look as though they need to be changed. The only problem is that the nail will continue to grow, so the root of the nail will show by the end of two weeks. Soak gel manicures tend to be a little more expensive, since they last longer and dry faster. Make sure your manicurist and nail salon are clean and professional before receiving a soak off gel manicure. ABC News ran a special in June, 2010, about a woman, Jane Ubell-Meyer, who received the gel manicures, said that after her experience she felt that everything she touched caused a shock. 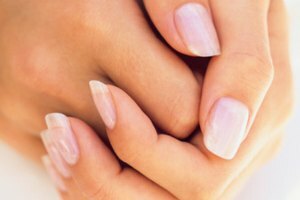 The article, written by Elisabeth Leamy and Tracey Marx, states that the soak off gel manicures themselves have not been proven to cause harm, but the reaction may have been caused by an unskilled manicurist. In Ubell-Meyer's case, the nail technician filed her nails, scuffed her skin, and the chemicals penetrated through to her nervous system. Be sure to check out the safety conditions and the professional background of the salon and workers to avoid these problems before you get a soak off gel manicure. Dallas News: Do Gel Manicures Really Last Two Weeks?